I was eager, young, and wanted to know it all! I was passable at fire-eating, loved the snakes, had good hands as a magician, understood the principals of the human dynamo act, was able to talk, (I loved the mike) grind, and do a myriad of other jobs on the show but as a sword Swallower I was the king of the mediocre. I never got good enough to do anything but work the bally, and the fire-act was much more dramatic. I learned the basics of sword swallowing from a performer on another show, named the "Mighty Ajax" a huge man who spoke broken English. He gave me a bayonet, which was the only "sword" I ever had. Often, I'm asked "where does the sword go", by skeptics who would rather look for trickery, than just to accept that what they see is true. The sword enters the glottal chamber, passes the epiglottis, the pharynx, and enters the esophagus, must be pushed (a little) past the muscle that closes the stomach, and then as far as you will allow it. You'll know how far you can go into the depth of the stomach once you first touch the inside of the bottom of your stomach, and will never forget the feeling! 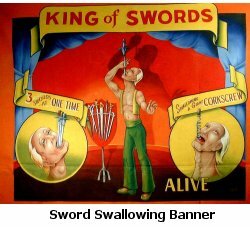 The Fundamentals: The thing that separates sword swallowers from sane people is the ability to control the "gag-reflex" put there by whoever designed our wonderful bodies to prevent foolishness of this kind. Actually the gag-reflex is part of our system, there to prevent the ingestion of anything foreign. The first lesson then is to overcome it, and maybe to learn some control over the muscles that close the throat. No one can tell you how to open those muscles, it's one of those things like wiggling your ears, and it's also the secret of being able to regurgitate.....a whole 'nother act. At that time I was able to swallow and return to my mouth fairly large objects. Excuse me for digressing, it seemed to fit here. Back to the wonderful world of gagging. The reflex can be dulled by frequent abuse. Many times a day, you stick your finger down your throat, use things like bananas and cucumbers to make yourself choke, and anything else you can think of to set off the reflex, until it just quits working, or nearly. It took me about two weeks of trying until I finally was able to shove my finger down my throat without much response. By now, you have the idea that this is something you really, really want to do! Along with the gagging, you will also have a pretty sore throat. There is also the possibility of infection, I realize now, but then I was, of course, invulnerable. (After all, I was in show biz!) A note. You must take your own responsibility for any damage you do to yourself. If you do this at all it has to be at your own risk. The Tools: Much attention has to be paid to whatever you stick down your throat. The slightest irregularity, even a dust particle can cause you to gag, which can at the least be embarrassing, and in the worst case fatal! Quit now, while you can, I lost two friends to accidents related to sword swallowing. You must cultivate a strong habit of continually wiping the blade(s) you use, stomach acid is extremely corrosive and will cause pits in almost any blade. Any blade you use must be impossible to separate from the handle, be smooth without any etching, nicks, or filigree. The edges must be removed and rounded, and the "point" must also be removed and rounded to at least the radius of a five cent coin, and ideally more. Without exception, the blade must be nickel-plated. Chrome plating is easier to get, but will peel and flake. over nearly every inch of his body. He would routinely do a "sword-sandwich" of six blades, all full sized. There is a young man, whose name escapes me, who does seven currently performing, but the blades are skinny. Alec had no such luxury. His feature was a trick he called the "Shimmy-Shawabble" which was a plated layout pin bent into a series of "S" curves, that made his Adam's Apple visibly go from side to side when he passed it up and down his throat! One of the friends I lost was an East Indian named Shumpert Eko, who swallowed one of the earliest neon tubes. By the way, in spite of the claims that the whole body shows the light, the only place it shows is at the larynx. It was the neon that killed Eko. I think one of the most elegant of today's performers is Istvan Betyar, who appears all over the world. He has the feeling of the old days, with the flair of today. Sooner or later, someone will ask you "what's the trick?" Ask them for a piece of dry spaghetti out of their own box, and pass it down your throat. It's easy, proves that it won't fold into the handle and makes you look like a star, unless, like I did, you break it off in your throat. I drank a lot of water that day. Please Note: Sideshow Central and it's staff members in no way recommend attempting to learn any sideshow act without the proper training by a skilled professional.